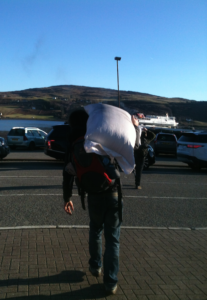 A small but determined and engaged group of crofters from the isle of Lismore in Argyle and from Lochaber undertook the long journey to Uist last weekend, braving ferry cancellations and road closures. The aim: to learn about cereal seed growing in a crofting context, i.e. for small-scale producers in the north west of Scotland. They represented Scotland the Bread with Doughies baker and SCF crofter Adam Vetch, keen to start a Rye-volution in his crofting community in Lochaber. 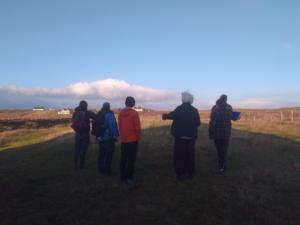 Other members of the Lochaber Environmental Group equally keen to develop more local food and to source seed of traditional Highland varieties whilst the Lismore crofters , also engaged with the Scottish Crofting Federation, are already involved in intercropping field labs of the Soil Association Scotland and interested in cereal mixtures. But how do you start a Rye-volution in crofting areas where grain has not been grown since the 1960’s? This was an ongoing conversation throughout the day, in the evening and during the journey back home – while eating delicious sourdough bread from Adam’s bakery. 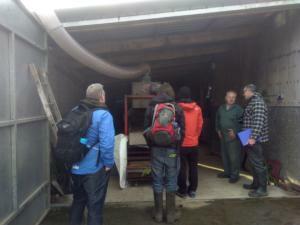 The training part started at the Blackland Centre on Grimsay, a unique crofter-led initiative for Agricultural Research and Practice in the Outer Hebrides. The centre has an extensive machinery-ring for members and we learned how the ring works and showed the equipment, all specialized machinery for very small fields and small-scale production. As a contribution to the ongoing trials with Shetland cabbage on the croft, some Shetland cabbage seeds were given to the centre. The Shetland native landrace thrives on Uist. 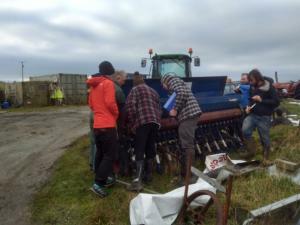 On the second croft we looked at the entire process of cereal growing and machinery useful in a crofting context (small-scale and low-budget) : seed drill, how to build your own grain seed drying facility, how to use a grain moisture measurer, a seed grader and simple grain seed storage. On the third croft we looked again at the process of cereal growing and especially at reaper-binders, how they work, the advantage of harvesting by sheaves. Chrissie kindly drove us to the machair and showed where the cereals are grown, rotation practices and how the crofting township works together.